High on the fell below Grit Fell in the Forest of Bowland there is an arresting sight. Three stone boxes stand in line as if ready to accommodate guardsmen from Buck House. These were constructed by environmental artist Andy Goldsworthy who studied at Preston Polytechnic (now UCLAN) in the 1970s. On closer inspection you realise that they would be quite unsuitable for sentry duty or even chairs but nonetheless they make for a worthy objective on this exhilarating walk on the edge of Bowland. Start. Little Cragg Car Park LA2 9ET GR545617 [Please note that the postcode is an approximation!] There is an element of challenge in this week's walk - finding the location. Confusion will arise due to two elements 1. The postcode covers a wide area. 2. There are a number of "Littledale Roads". Grade: Moderate with strenuous bits. Unless proficient with map & compass or GPS do not venture onto the heights in misty conditions. 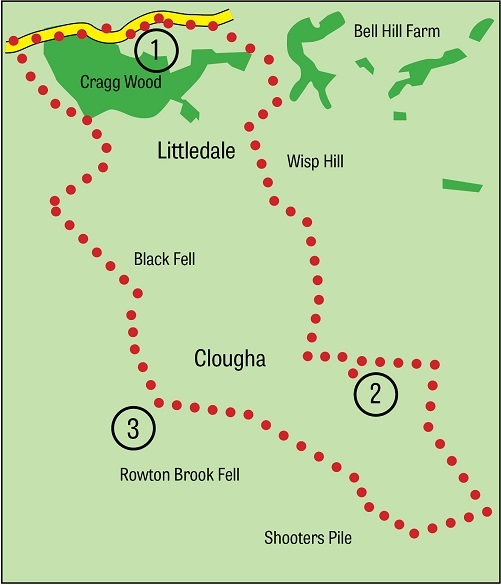 Map: OS OL 41 The Forest of Bowland and Ribblesdale. turn right onto a footpath leading downhill towards a substantial barn. Soon after passing it turn right alongside a small stream and entering open access land. Keep ahead to a ladder stile leading onto moorland. Here pick up an indistinct path that keeps parallel with the wall on the left and climbs steeply at first through peat and heather. After 500yds the path turns away from the wall and begins to ascend the fell gradually. Keep on it as it passes between grouse butts to reach a substantial landrover track. Turn left. In less than a quarter of a mile bear right to reach the Goldsworthy boxes which in clear weather would have been in sight for quite some time. turn right on a narrow rocky path that takes you to the summit of Grit Fell. Besides a cairn and peat and heather there is not much else to see. Continue along the path to a ladder stile. and continue across open and at times very boggy moorland in a north-westerly direction. After a second stile in a fence continue to the trig point. to reach a gap in the wall on the left just before a fence coming in from the right. You may be led to believe this is another expression of Mr Goldsworthy's work. A little distance beyond it is the landrover track you intercepted earlier in the walk. a property on a drive bringing you to Littledale Lane. Turn right for the car park - sorry this entails a bit of a climb! Note: While the Bowland uplands may have all the characteristics of wilderness they are in fact heavily managed as grouse shooting areas. Until the Countryside and Rights of Way Act of 2000 access to these fells was restricted to just a few permissive paths (such as the one crossing Wards Stone, Grit Fell and Clougha Pike) Sixteen years on from the Act and the Bowland Forest still seems pretty well undiscovered by walkers outside of Lancashire. This may account for the fact that when Malcolm and I checked out this route in September we did not meet a single walker.